Here I'm going to share my experience with OpenWrt extroot on a TP-Link MR-3220 v2.4 router. Though I did this on a MR-3220, this guide also applies to other routers like TP-Link WR703N, MR3020, D-Link DIR-505 etc etc. Just make sure you have downloaded the correct firmware for your router. Little about MR 3220 v2.4 hardware quality, I teared it apart within 1 hour of receiving, the hardware quality is average with average quality components. Enough hardware introduction, lets start the main topic, installing OpneWrt and configuring extroot on a USB pendrive. OpwnWrt firmware installation is very easy through the web interface and openwrt extroot part is same for almost any other router too. Which OpenWrt firmware version should I choose ? Which filesystem should I use for OpenWrt extroot ? This is one of the most important question, choosing the correct OpenWrt version is absolutely crucial. This router works perfectly with the latest OpenWrt trunk (Designated Driver), stable 15.05, 14.07 or 12.09 . But OpenWrt is bloating day by day while limited NOR flash storage is not, the stable firmware is also bloated with LUCI web interface. The free JFFS2 space after installing OpenWrt is decreasing too. So you can't install more than a few package with this limited space, that's when putting extra files on a external drive is necessary. After about 12-14 hour experiment with various OpenWrt versions, I figured out that only OpenWrt 14.07 (Barrier Breaker) or earlier versions have the right amount of free JFFS2 space to install required bare minimal minimal packages to setup an extroot. Note: There's another little difficult way to run latest OpenWrt on your router, then you've to build OpenWrt custom firmware. There are other UNIX-like filesystems like BTRFS, LVM2 PV , UFS etc. but none of them will fit in the 288 KB free JFFS2 space, so I didn't tested them. So the final choice is for a router with 4MB flash, choose only OpenWrt 14.07 or earlier and ext4 as extroot filesystem. Request to OpenWrt pro users, if you had ever setup chroot with any other filesystem except ext4/ext3/ext2, please mention. Download the OpenWrt 14.07 firmware from here . WARNING: Do it at your own risk, event with great precautions there is a chance of bricking the router. If possible connect the router to an UPS before flashing it. Power on the router and connect a PC through a ethernet straight cable (patch cord) to one of four the LAN ports(the yellow ones). Open up a browser and go to this address; 192.168.0.1 to access the web interface and login. Username: admin Password: admin . Go to the System Tools > Firmware Upgrade choose the previously downloaded OpenWrt firmware with the Browse button and Hit the Upgrade button. Wait for few minutes to let the flashing complete and automatic reboot. Installation is complete now your PC will automatically receive a different IP via DHCP. At this step the router must be connected to the internet, you could use your existing DSL/cable internet for this purpose or share an existing connection from your PC. I personally did it by sharing my 3G connection with Network-Manager from my laptop. That's all, check free flash space with df -h , do not install anything more ! if you try to do so, any packages larger than 10KB will return no space left on device error. Now load all necessary kernel modules with modprobe command. Or simply reboot the device with reboot command. Lets partition the USB drive, another question, how much space should I use for extroot partition? Just 100-200 MB is more than enough, I allocated a 200 MB ext4 partition for extroot, you could use more if you wish. I used Gparted for partitioning a 4 GB USB drive. Now safely remove the USB drive and plug it in the routers USB port. After the reboot is complete login to the router with ssh again and check the free disk space with df and mount command. The df commnd should return a lot of free space available at rootfs, that means extroot is working fine. I hope this simple beginner friendly tutorial will help you to start your experiment with OpenWrt. If you have any question or suggestion, just leave a comment. Also don't forget to share this article with friends. tried it on my mr3220 works like charm ! Isn't it possible to install newer firmware and then remove some packages to free up space? Say, removing web interface and IPv6 support? Hi, the tutorial is very clearly written, good job! I have a problem with extrooting on Zyxel Keenetic Omni: it does the extroot part fine, after reboot I can see a lot of free space on /, but for some reason I have internet access only on the router itself (ping google.com works from ssh), but not on devices connected to hotspot or directly to ethernet port on router. It works fine before extrooting. Can you please help me with the problem? What happens if you remove the USB drive before booting the router? There might be some bad network configuration, which you can find in the /etc/sysconfig/network file. Better try to setup openwrt extroot again if everything fails. Thanks ! It's a great feedback. Thanks for your clearly written and informative tutorial. Worked great for me on an older TP-Link TL-WDR4300. Thanks Arnab for a brilliant turtorial! I've followed your build turtorial as well. Everything works well up until I reboot after fstab configuration. When issuing the df command, I still haven't got very much space under rootfs. Any tips you can give me? Hi Alex, seems like the extroot is not configured properly. Double check your fstab configuration. I triple checked fstab, still didn't work. The USB drive is present before un-mounting and configuring fstab, but afterwards, nothing. Same result. I'm running a TL-MR3420 by the way. And the USB drive is an old 500MB drive (hardly used), formatted as EXT4 in Minitools Partition Wizard under Windows 7. Thanks again for you time and effort! Another thing I want to say you, use ext2 formatted USB drive instead of ext4. Nevermind, seems like perhaps my USD drive was faulty. Not sure, but now it's working nevertheless. Thanks, its really good tutorial. Could you please build OpenWrt 15.05.1 with LUCI that works with extroot? By remove some unnecessary package. Which router ? I'll remove the IPv6 related packages. Thank you. I use your img. Also same problem. I can't enter by web only by ssh. It's because no web control interface is installed, install LuCI after setting up the extroot. And why it's not installed ? You can't setup extroot on MR3220 with OpenWrt 15.05.1 if LuCI is installed, too little free space left on the 4 MB NOR flash. Hi Ahmed, surely I'll try to free up some time to build your firmware. Which configuration you're using to make your custom firmware ? Does it include the web interface ? Without the LuCI web interface to save flash space, supports extroot out of the box. PROFILE=TLMR3220 make -j4 image PACKAGES="-kmod-ppp -kmod-pppoe -kmod-pppox -ppp -ppp-mod-pppoe -libiwinfo-lua -liblua -libubus-lua -libuci-lua -lua -luci -luci-app-firewall -luci-base -luci-lib-ip -luci-lib-nixio -luci-mod-admin-full -luci-proto-ipv6 -luci-proto-ppp -luci-theme-bootstrap -uhttpd -uhttpd-mod-ubus kmod-fs-ext4 kmod-usb-storage kmod-scsi-core block-mount kmod-lib-crc32c kmod-crypto-crc32c"
After installing extroot, can I upgrade OpenWRT to CC, keeping extroot intact? Thanks. The upgrading process through sysupgrade works in a odd way, it creates a backup configuration file via UCI and restores that after finishing. Another point to remember, each OpenWrt major release are quite different. If it repeatedly asking for password, let me know. is it possible to upgrade to Chaos Calmer or will it just delete all configurations for extroot? You can upgrade to CC with sysupgrade command with all changes from extroot, but that's not perfect. 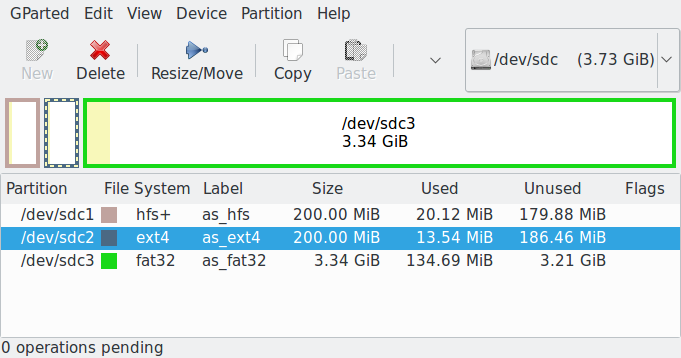 sdb1 is the partition I had prepared for extroot with ext4 file system. I had tried both gparted and fdisk utilities. Request direct me. Thanks in advance. Perhaps yo're missing the proper drivers for ext4 partition. Try with a ext2 formatted partition. What's the output of the dmesg command just after running the mount /dev/sda1 /mnt command ? Missing kernel drivers could be located from this log. I am actually using my 4G wimax modem with MR3020 router. I also have 2TB USB HDD. After installing openwrt can I use both (HDD+4G modem) at the same time using a USB hub? It may work or may not, depends on the USB hub, cable length and some other unknown parameters. In my case, the exact setup like your with a 500GB HDD and 3G modem(Micromax brand)) failed to work, while a CDMA modem(MTS, ZTE AC2766) worked perfectly. Hey do you know how to return it back from previous version? Please clarify your question, did you mean that how could you go back to an older version of OpenWrt ?